Both Apple and Samsung this week predicted slow growth for smartphone and mobile phone sales in early 2016, making investors queasy. Apple's stock dropped 6.5% at Wednesday's market close after CEO Tim Cook told investors he expects iPhone unit sales to decline for the current quarter compared to a year ago. Apple's iPhones make up the majority of its revenues. Trading in Apple was flat this morning. Samsung's stock also dropped by 2.5% late in the day of Thursday trading after the South Korean company reported a 10% drop in mobile sales in the last quarter of 2015. The company said it would be a challenge to maintain operating profits for 2016. The forward-looking comments by both companies reflect a saturated market for smartphones, especially in the U.S., and in other developed countries. Customers are also keeping their smartphones longer. Average users don't see a reason to upgrade every year or two because the newest smartphones aren't seen as significantly better than what they already own. "Most people in mature markets who want a smartphone already have one, so saturation really is a factor," said Jack Gold, an analyst at J. Gold Associates. "Couple that with the fact that new devices are a slight improvement over the old ones, rather than truly major upgrades. Most users aren't anxious to [pay] for a new device when theirs is perfectly functional and meets their needs." In the huge China market, consumer interest in buying smartphones is expected to remain solid, especially in cities in the developed eastern region, but China's economy is slowing and its currency is in question, affecting both Apple and Samsung sales and the way investors view those companies, analysts said. Research firm Strategy Analytics said China's smartphone shipments actually dropped by 4% in the fourth quarter of 2015. "The smartphone market has turned from a sprint to a marathon," said TBR analyst Jack Narcotta. "The ramp-up since 2007 has been really exciting, and it's been an unbelievable run, for Apple especially, … Now the market is going to be really flat because you have a lot of good devices that don't cost a lot. There aren't that many people with smartphones that are multiple generations behind." So, has the smartphone market peaked? Analysts were reluctant to say the market has indeed peaked, but conceded that it will be much flatter than in the past. Apple might see a down first quarter, and a smaller than normal increase in coming quarters, for instance. 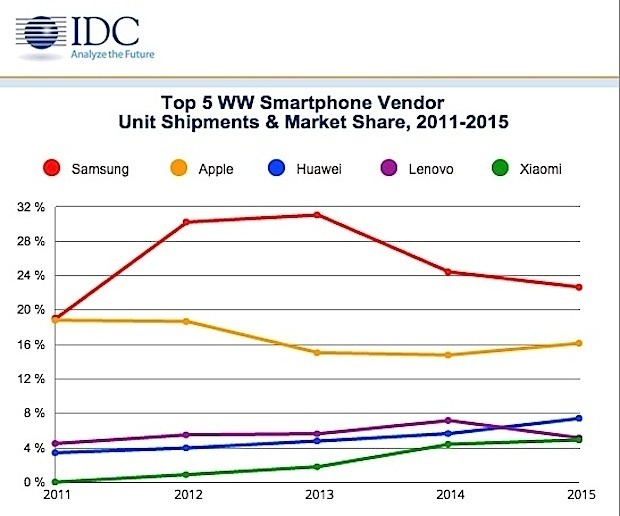 Both IDC and Strategic Analytics said this week that global smartphone shipments surpassed a record 1.4 billion units for all of 2015, up by more than 10% over the prior year. For the fourth quarter of 2015, however, smartphone growth slowed to 6% compared to a year earlier, the slowest growth rate ever, Strategy Analytics said. In the U.S. alone, Strategy Analytics estimated smartphone growth for the fourth quarter of 2015 was just 4%, and predicted it could drop to 1% to 2% growth in the current quarter. In China, the last quarter of 2015 actually saw a 4% decline. "China is a maturing market and facing economic headwinds," said Linda Sui, an analyst at Strategy Analytics. For all of 2016, Strategy Analytics said all regions of the world will see single-digit growth, except for Africa, where double-digit growth is expected. "There is still room for smartphone growth, but it will be mainly in emerging regions where users are moving off feature phones to smartphones," said Patrick Moorhead, an analyst at Moor Insights and Strategy. "Even in emerging regions, sales will be driven by overall economics, and consumer confidence right now is pretty low." Of the six technology analysts interviewed for this story, all said that Wall Street's negative reaction to Apple's comments about smartphones are probably an over-reaction by investors accustomed to Apple's strength in smartphones. It is estimated that 90% of the profits made from smartphones go to Apple, even though Samsung sells more smartphones, the most of any company, Moorhead noted. "Apple stock may be taking a beating, but that company has had almost a decade of bringing massive growth and massive change, and all these investors have made money off Apple, so now the investors are facing the first quarter in a long time of no growth," Moorhead said. "Wall Street is disconnected from reality a lot of the time because of their short-term focus." IDC analyst Anthony Scarsella said the stock market reacted negatively this week primarily to Cook's comment about the current quarter being down and didn't take note of Apple's view that smartphone penetration is still low in China and India. "I don't think the smartphone market is at a peak yet; there are still opportunities to grow," Scarsella said. A big factor in future smartphone growth could come with innovations in the way upgrades are sold, the analysts said. Apple introduced the iPhone Upgrade program last fall, and most of U.S. carriers have eased the purchasing terms for smartphones. "You can walk in a store and pay no money down and walk out with a high-end flagship phone," Scarsella noted. But the impact such offers have on smartphone growth won't be felt for a year, he said. Even with their negative news this week, both Samsung and Apple aren't expected to make a big change in their smartphone strategies. Samsung is widely expected to launch its next premium smartphone, the Galaxy S7 at Mobile World Congress on Feb. 21. The next iPhone 7 will hit later in 2016. "Once the iPhone 7 comes out, we're expecting it will be pretty solid," Scarsella said.